SK Telecom has been selected as a new strategic partner of Riot Games after a joint bid to organize League of Legends Champions Korea. All three major telecom service providers of Korea, KT, LG, and SKT attended the bidding to find Riot Games’ LCK partner in late March. And finally, the results were announced, that SK Telecom was the organization that won the bid and became Riot Games’ new strategic partner. 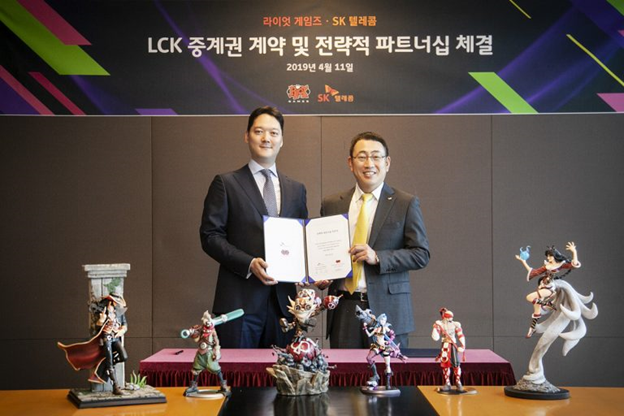 With this partnership, SKT will now become an official sponsor of the LCK tournament until 2020 and will receive special privileges to create Virtual Reality / Virtual Reality Interactive content. Use related to the LCK tournament. This partnership is not only for each LCK but also for SKT with broadcast rights for League of Legends’ other international tournaments. Starting from LCK Finals Spring 2019 on the 13th, SK Telecom will broadcast live LMHT professional matches on their OTT service, oksusu. As for the fans, Riot Games intends to add the feature watch the game through the players themselves. That is, now people can choose to watch the game from the perspective of the players who are directly playing. “I am very pleased to have successfully established a partnership with SK Telecom in such large areas. With them, we will strive our best to make the LCK tournament, in general, to become a better tournament ”. – Park Jun-kyu, leader of Riot Games Korea.